It’s not my intention to incite panic in my readers, so I’ll say it quietly. Thanksgiving is only eight days away. If you are hosting the Thanksgiving feast this year, you are likely breaking out in a sweat just thinking about it. “What is Aunt Maude going to say about my stuffing recipe?” “What if I overcook the turkey and it’s too dry to serve?” “What if Uncle Herman hasn’t taken his Beano and he sits beside my mother-in-law?” Well, if you weren’t panicking before, you are now. Sorry about that. Okay, pour yourself a glass of wine, take some deep breaths and spend a few minutes reading through this post. I have all sorts of Thanksgiving menu ideas for you. There are entrees to please the traditionalists (turkey, of course) and your vegetarian relatives. Do you really want to mess with tofurky? I didn’t think so. There are enough side dishes to cover all the bases, plenty of sauces (don’t miss the gravy tutorial) and you can’t forget the desserts (more than pumpkin pie). And for goodness sake, remember the motto of any good host or hostess…delegate, delegate, delegate. Dara, could I order this scrumptious Thanksgiving dinner for 8 please? Absolutely beautiful collection of recipes! Thank you! Thanks, Kay. 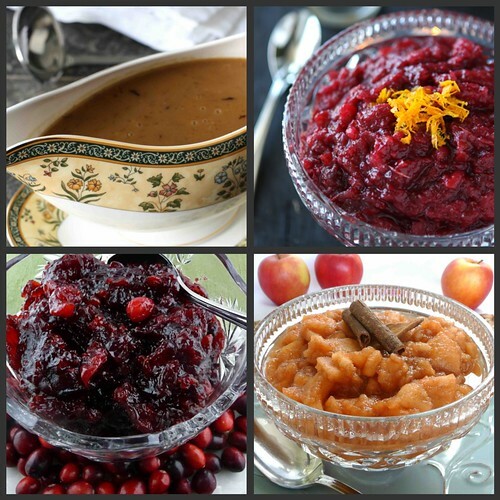 Knowing your recipes as I do, I bet you’ll be making a wonderful Thanksgiving feast. Whew! Everything sounds so freaking delicious. Awesome round up. Your desserts make my heart melt. Thanks, Katrina. I’ll admit that dessert is not usually my focus on Thanksgiving (I’m a stuffing gal), but some of those desserts are big hits with my family. Whoooaaaa, that savory bread stuffing with sausage and herbs? Kinda freaking out over here. That’s the dish that I can’t stop eating on Thanksgiving. Thanks, Bev! Beautiful! I might need to come to your house for Thanksgiving! I’ll set an extra place for you. Oh boy, I wouldn’t know where to start. I know how I’d end though. Full as a tick! Love that expression, Curt! Thanks so much. I’m coming to your house for Thanksgiving! You know you’d be welcome! No need to stress, Winnie. Knowing you, you’ll probably put on a beautiful, healthy feast. I think you have officially blown up my Thanksgiving inspiration board on Pinterest with this post. 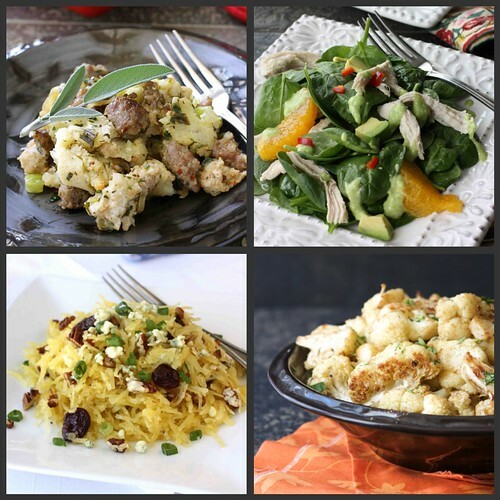 I’d have to say my favorite are the sides, especially the cauliflower with Indian Spices and the squash. So, I’ll be over so we can have that glass of wine and I’ll bring my big dinner pants. So I can undo the button of course. Thanks, Heidi. I make that cauliflower to snack on during the week and find myself popping it like candy. I can belive it either that Thanksgiving is next week – i have no idea where the time is going. Great recipes here !! I have to try the spaghetti squash sounds soo good. Thanks, Ewa. I make that spaghetti squash frequently for lunch. It’s very fresh tasting. My goodness! You’ve been busy! This all looks amazing Dara. My favorite part of it all is the gravy. There’s nothing better imo. Thanks, Julie. Gravy on stuffing – that’s where my heart is. Mmmmmm look at that delicious Mushroom & Cannellini Bean Ragout! Thanks, Brittany. It’s a great option for vegetarian guests. Your tip on delegating is key, really helps cut down on the stress! Both our parents help and bring so much we usually end up just cooking the bird and one or two side dishes. 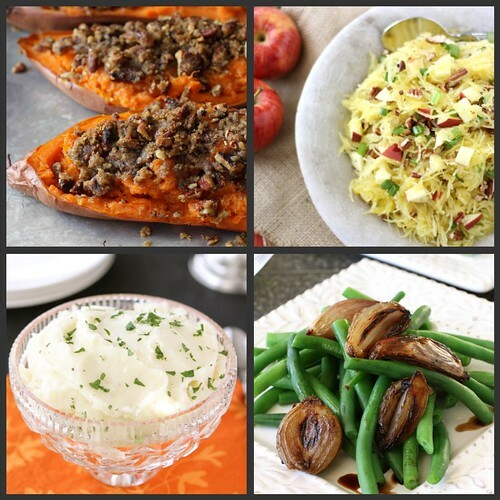 I still want to do a few nice side dishes though, so this list is great! You’re right, Chris. Delegation is the key for an enjoyable holiday. Nobody likes a stressed-out cook. It all looks so wonderful. I would have a hard time deciding on which ones to make for the big day! Thank you! That’s the beauty of Thanksgiving – you get to taste a little bit of everything. These all look divine but that perfect pumpkin cheesecake has my name all over it! Great roundup! I haven’t even begun to think about Thanksgiving! Wow, what a spread, so much to choose from! We’re keeping it simple, so I think that might be why I’m not panicked…yet. Your line up looks delicious! I’ve never incorporated spaghetti squash into Thanksgiving before, but I love your recipes 🙂 Definitely worth making next week! What an awesome looking Thanksgiving menu! That turkey is calling my name…nom nom! Ah. Hell yeah. 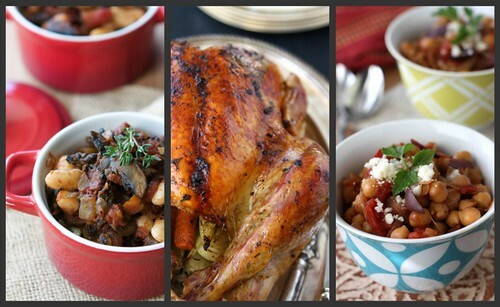 Now that’s a collection of Thanksgiving inspired foods perfect for the big day. I’m just a month late. Everything looks amazing, Dara! Wish I was sitting at your table for the big day. Oh my gosh, Dara! I think I’m in Thanksgiving heaven! I think my family and I are going to have to alter the menu we wrote out a couple nights ago- we need to add a few things from here that we don’t have on the list. Especially those twice-baked sweet potatoes! Dara, this round up is fabulous. Now if only we could crash in on your Thanksgiving fun! 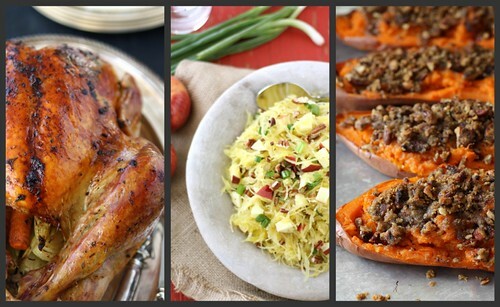 Now this is what a call Thanksgiving dinner, I especially like Pumpkin Cheesecake ..Amazing dishes!! !Thanks for sharing and have a wonderful day!!! I’ve definitely been having some mini panic attacks but am excited to cook! Great list of recipes, though now I want to make so many more things! I love it all! 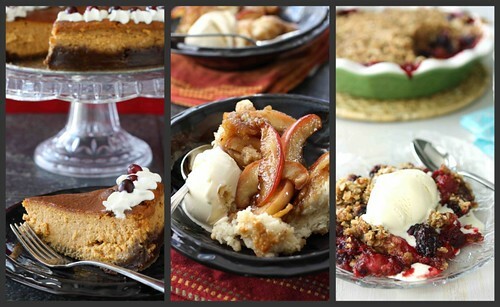 Wonderful recipe round up! Your intro is hilarious! Some good recipes here too, tho’ we don’t have Thanksgiving where I live. I’m off to look at the recipes in more detail. PS Is Beano what I think it is? I am so grateful that I don’t have to cook the whole meal – or I probably would be freaking out!! But, I did agree to make the rolls, so I still am sweating it a little. Perfect rolls on Thanksgiving are a must!! But I do have to say, after seeing all of your recipes, it kind of makes me wish I was contributing more. Looks like I need to do a mini Thanksgiving meal for just my little family! I dropped by for inspiration for a new side dish this Thanksgiving. I think I just hit gold! It’s hard to decided, but the spaghetti squash with Gorgonzola sounds amazing.